Discover the many facets of Cuban culture through the eyes of locals - including its fascinating arts, architecture and initiatives - on a people-to-people journey filled with immersive, interactive experiences alongside residents from all walks of life. Transfer to Miami International Airport and check in at the dedicated A&K counter for your short charter flight to Cuba. Upon arrival at José Martí International Airport in Havana, complete immigration and customs formalities and meet your local Cuban guide. 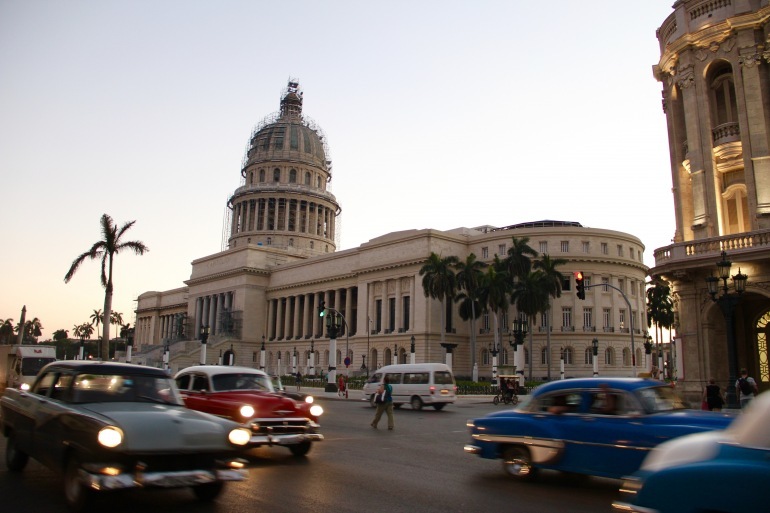 Embark on an informative tour of Havana’s historic and culturally rich neighborhoods. Later, transfer to the historic Hotel Nacional for a narrative on its fascinating past. Considered a national monument, the hotel was built in 1930 and overlooks the Malecon (seaside promenade) and Havana Harbor. After lunch, check in to your hotel. This evening, sit down to dinner in a private paladar (family-run restaurant), a unique, welcoming Cuban enterprise. This morning at your hotel, meet a local physician and engage in a talk on Cuba’s well-regarded public health care system, followed by an illuminating question and answer session. Visit a day care center, where you meet the teachers and get to know the students. Continue to Finca La Vigia, Ernest Hemingway’s former home, where The Old Man and the Sea and For Whom the Bell Tolls were penned. As you look through the windows and open doors of this remarkably preserved home, visualize the author’s life during the more than 20 years he lived there. After lunch, return to the hotel. This evening, visit a local artist in his home, with a chance to gain deep insight into not only Cuban art but home and family life as well. Light appetizers and drinks will be served. After this visit, sit down to dinner at a local paladar. Today, visit Las Terrazas community, just 45 minutes outside of Havana. Visit a coffee plantation and meet its staff to learn about the economic role of the coffee industry and its impact on Cuban society. Later in the town center, visit the bodega (convenience store), where locals use ration books to purchase specific amounts of limited items. Discuss the rationing system with the shop’s owner before visiting local artists and musicians in the community. Enjoy a typical farmhouse lunch with the opportunity to see how everything is prepared on a wood burning stove. Return to Havana in the afternoon, stopping at the whimsical studio of José Fuster, a renowned Cuban painter and ceramicist. Take part in a discussion about the artist’s work and the role the arts play in contemporary Cuba. Enjoy dinner on your own this evening. Today’s introduction to historic Havana begins with a brief presentation by a Cuba policy expert, during which you are immersed in the history of Cuba-U.S. relations, from the colonial era to the present day. Take part in a thought-provoking question and answer session. Then, pay a private visit to the Habana Compas Dance Studio, where you see a performance. Afterward, meet firsthand with the artists for a chance to learn about the Afro-Cuban rhythms, which meld flamenco and native salsa and rumba movements with percussion instruments. Then, enjoy a visit to Hotel Conde de Villanueva, featuring one of the city’s best cigar shops, dedicated to the history of tobacco. Later, learn how to create mojitos and other Cuban favorites during an interactive demonstration. Then, meet a local salsa teacher to talk about the history of this native rhythm and the importance of dance in Cuban life, followed by a lesson under your instructor’s attentive eye. This morning, witness the storied Colón Cemetery. Founded in 1876, it is the site of more than 800,000 graves and one million interments. Under the guidance of a local specialist, gain insight into the cemetery’s history and significance to the local community and pilgrims. Then stroll through Old Havana with a local architect, discussing the challenges and successes of city reconstruction projects, all the while absorbing the vibrant, extraordinary architecture that surrounds you. Early this evening, take a drive in the iconic “Yank tanks” (vintage cars) along the Malecón to the Magic Flute for an impressive view of the city. Here, enjoy a private concert of Buena Vista Social Club-style music, sponsored by the Cuban Institute of Music. Then, engage in a post-performance discussion with the musicians — a great opportunity to learn about the impact music has had on Cuban culture and the ways in which it has influenced music in the United States and beyond. Depart early from Havana. Arrive in Cienfuegos, the “Pearl of the South,” so-called for its stunningly beautiful bay. Set out on an informative city tour through this UNESCO World Heritage Site, with a stop at the Teatro Tomas Terry. Meanwhile, take the opportunity to talk with your local guide about Cuban life, be it about the two currencies used or the cost of living on the island. Take a stroll down the Paseo del Prado, the longest tree-lined boulevard in Cuba. After lunch, enjoy an orchestral performance at the Colonial Museum. Then, head to Cayo Santa Maria. This morning, travel to Remedios, considered one of the oldest settlements in the country. Take a ride by bicitaxi (pedicab or rickshaw) through the town and into the main square. Join the bicitaxi owners at a local coffee shop, gaining insight into their day-to-day routines and the ways in which they maintain their vehicles. Depart Remedios to the Sugar Museum in Caibarién, housed in the historically significant Marcelo Salado Azucarera (Sugar Mill), where you learn about the role the sugar industry played in Cuba’s history. Then, board an old steam train (formerly used to transport sugar cane to the factory), and travel to El Curujey for a traditional, authentic Cuban farm lunch. See a typical farmhouse as well as a demonstration of palm climbing. Return to your hotel for dinner. Drive to Santa Clara, stopping at the local stadium, where you engage in a shared pastime with Cuban residents: baseball. During the event, you meet and talk with the players about sports in Cuban life, with the opportunity to play a few innings together. In the small town of Camajuani, visit a cigar factory, where you delve deeper into the history of Cuba’s tobacco industry and learn about the rolling process from workers themselves. Upon arrival in Santa Clara, proceed to the Casa de la Cultura, where members of the Cuban musical group Melodias Antillanas perform traditional music on antique instruments. Hear a concert of Cuban classics, followed by a talk about traditional music and its role in local culture. After lunch, tour Santa Clara, before returning to your hotel for a farewell dinner. Last group event: arrival at Miami International Airport on Day 10.